Better Vampire NPCs overhauls Skyrim's vampires. They will be leveled according to the PC and get stronger with advanced perks, spells, and all new abilities. Vampires can now be many different classes: one or two handed, light armor, heavy armor, mage, light bowman, heavy crossbowman. More variety, more challenge, more fun! Better Vampire NPCs SE German Translation You need the original mod first! - Many tweaks and balances should make gameplay more fun and NPCs less OP. - Vampires now take even more damage from fire. - Vampire attacks are now disabled by default - turn them back on if you wish by crouching and using the Vampire Bloodgem. - Vampire attacks are now led by regular vampires; Skyrim initially had vampire bosses attacking ... which are a whole tier above the character level (this explains townspeople being slaughtered so easily or characters being vastly outmatched). - The minimum spawn levels of vampire bosses have been decreased. - Vampires that do attack towns will have a max level so guards actually stand a chance. - If vampires are weak in combat they will use Mist form less often and be unable to spam it repeatedly. - This version has QNAM values for tint that match the Unofficial Patch; if you do not use the Unofficial patch (and you should) there might be slight discoloration, but no dark face bugs. I have now uploaded my regular version and a version that makes NO APPEARANCE CHANGES to help with compatibility. The default NMM download is for no appearance changes. - Several updates have been implemented from the Unofficial Skyrim Patches. - Recipe for creating a Vampire Bloodgem now requires a FILLED Common Soulgem (instead of an empty one). - Coldharbor Daedric Armor now glows blue instead of red. - Hand checked NPC entries in XEdit to ensure no erroneous entries. - This version now has ALL appearance changes removed. Al other aspects of the mod remain. - There are no edits to any NPC appearance, so no facegen files are needed, and this mod will never create a dark face bug. OTHER mods may still do this, but mine won't be responsible. - This version will not fix some vampires that have wrong eye types, it will not add fangs to females, it will not make vampires paler as they grow older, it does not add in more male vampires, it does not add in a few argonian and khajiit vampires, it will not give glowing eyes to argonian and khajiit vampires. - Any vampire appearance mod that is loaded AFTER this mod will work perfectly - hopefully they have exported their own facegens properly or you might get a dark face bug from their work (some mods are incomplete out there too ... they often don't cover all NPC vampires or don't affect all vampire eye types). - Fixed Khajiit and Argonian nif files so they point to the correct texture files (should prevent ctds). - Added in fixes to Vampire eyes from the "Eyes Glitch Fix" by bellwood2206 so the invisibility glitches should be gone. - Added in Vampire teeth for females - they are identical to those in males. - Removed a couple of glitched facial hair types. - A "Vampire's Bloodgem" will now be added to your inventory (under Misc) when you start the mod. Using this bloodgem WHILE SNEAKING will allow you to customize aspects of vampires and this mod. - If your initial Bloodgem is ever lost or accidentally sold, Vampire's Bloodgems are also added to the loot for vampires level 15 or over. Vampire's Bloodgems can also be forged using a Common Soul Gem and Blood Potions if you are a Vampire race (with the keyword) and have at least 25 Alchemy and 25 Enchanting skills. - Save up your Vampire's Bloodgems ... they can be smelted into Bloodglass and used to craft powerful Bloodglass weapons. - All Bloodglass weapons can be tempered to improve them. - You must have the Glass Smithing Perk to make Bloodglass weapons - they are slightly less powerful than Daedric weapons, but have added effects that are independent of any enchantments you might add. - Added effects on Bloodglass weapons can be disabled in the mod if you want. - Vampires will now be able to use blood aura shields properly in combat - the effect wasn't always applied before. - More combat variety has been added for vampires of all levels. - Some Vampire eye textures have been fixed so they all use Dawnguard glowing eyes (you can load any other Vampire eye texture mod after this one to change this). Vampires in Skyrim are usually predictable and cliche. They often look the same and have similar abilities regardless of their level. This mod will add much more variety to your game and make vampires more challenging and more varied. This mod improves all of the generic and named vampire NPCs in the game (except for Serana, Valerica, and Harkon). The Vampires in this mod will spawn according to your level, have different spells, unpredictable AIs, varied armor according to their class and level, and even special weapons you haven't seen before. Vampire appearance will change slightly - stronger, more ancient vampires are increasingly paler. Some Vampires will turn into a mist when they are low on health, some will use Blink Attack to teleport beside or behind you, Vampire weapons can infect you with Sanguinare Vampiris, and unique classes of Vampires attack differently. All armor and weapons that you might find on these new vampires have new temper recipes so you can improve them if you wish. Vampires will scale in level and power with you all the way from level 1-130 (some named vampires can go even higher). Many abilities also scale with vampire level, so be prepared for them to put up more of a fight at higher levels. Vampires can also drop Vampire's Bloodgems upon death, or, if you are a Vampire yourself, you can craft them if you have 25 Enchanting and 25 Alchemy skills (using a Common Soulgem and Blood Potions). These Vampire's Bloodgems can be smelted into Bloodglass Ingots, which can be used to craft brand new Bloodglass weapons. Bloodglass weapons can be tempered to improve them. You must have the Glass Smithing Perk to make Bloodglass weapons - they are slightly less powerful than Daedric weapons, but have added effects that are independent of any enchantments you might add. Added effects on Bloodglass weapons can be disabled in the mod if you want. The customization available with a Bloodgem will also allow you to make NPC Vampires allied to you (if you want)! Do you want to stop all Vampire attacks on towns? Do you want Vampires to stop turning to mist? Do you want Vampires to stop using blink attack? Do you want Vampires to stop using nightcloak (bats)? Do you want Vampires to stop turning to ashpiles when they die? Do you want to add more wilderness encounters with Vampires? Do you want to disable the added effects of Bloodglass weapons? This mod is compatible with vampire overhaul mods, like Better Vampires, Sacrosanct, or Vampiric Thirst. Vampires are modeled after Better Vampires and use its skills, spells, and abilities. Vampires are based off vanilla ranks/names. All material is standalone and does not rely on other vampire scripts, vampire races, etc. 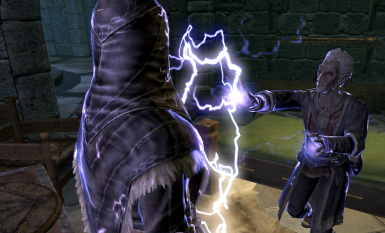 This mod modifies existing Vampire NPCs, leveled lists, and adds new spells, perks, abilities, armor, and weapons. My Vampires have customized AIs (with the exception of Serana, Valerica, and Harkon) so other AI mods won't affect my NPCs. rebuild your bashed patch with the "Relev" tag for my mod. You need to make a new bashed patch with this mod if you already have a bashed patch that changes leveled vampires. If you do not use a bashed patch, make certain my mod is loaded LAST after any other mods that alter leveled lists or change the levels of NPCs you fight. Some mods which alter Vampire NPCs may not be compatible (we change the same things) so there isn't really a way to "patch" that. It could be possible to combine traits into one .esp, but I won't be getting that complicated - updating in the future would be a nightmare. Your load order is very important for the regular version of this mod! - Load Better Vampire NPCs before Better Vampires (if you use it). 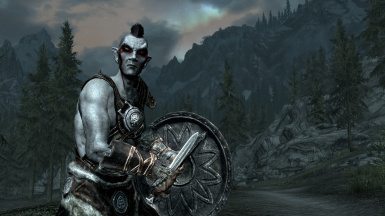 - Load ANY Vampire eye change mod AFTER Better Vampire NPCs. It can only contain .dds files (textures) and not facegens or you will get dark faces on NPCs. If you want to use a mod that drastically changes NPC vampire appearances, use my NAC version. - You can use an eye mesh modification mod (to get rid of glowing vampire eyes for example) if it is loaded AFTER Better Vampire NPCs. It may not affect my Vampire NPCs unless you go into the .esp and re-export all the facegen individually though. - You can use a fang modification mod for Vampires if it is loaded AFTER Better Vampire NPCs. It may not affect my Vampire NPCs unless you go into the .esp and re-export all the facegen individually though. Your load order is very important for the NAC version of this mod! - Load ANY Vampire appearance or eye change mod after BVNPCs - this version doesn't touch appearance, so other mods will have control and there won't be a conflict. - IF you get a dark face bug at all, it ISN'T this version causing it! Another mod you are using must have mismatching NPC values and facegens (or be missing facegens entirely). To install this mod, simply use NMM or MO. You can install this mod manually if you want to ... just copy the .esp file and loose files to your Skyrim\Data directory. Use LOOT to sort your load order, but I cannot see there being any issues unless another mod edits Vampire NPCs too. 1. Make certain you are not near one of my Vampire NPCs, or have any of the new armor equipped. 3. Remove my mod with NMM or MO. If you installed manually, delete the .esp file and the BSA from your Skyrim\Data directory. It may be best to let cells reset in your game. From everything I have read, waiting in a cell flagged "never resets" for 31 days will do the trick.